“If there is another world, he lives in bliss… If there is none, he made the best of this”. 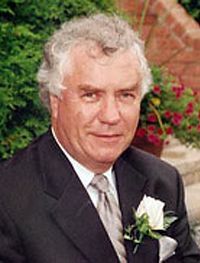 James (Jim) Mullin, born in Maybole on 4th November 1939, passed away peacefully on April 6th 2013, surrounded by his family, in Kanata, Ontario, Canada. He was the elder son of the late James Mullin and Mrs. Isabella Mullin of Maybole, who for many years ran a bakery business next to the Town Hall. He won the Ramsay Medal, and was school dux at Carrick Academy before going to Glasgow University where he graduated BSc (Hons) in Mathematics and Natural Philosophy. He emigrated to Canada shortly after graduating. He worked initially as a physicist for Atomic Energy Canada Limited (AECL). After only five years, he was appointed Secretary and later Deputy Executive Director of the Science Council of Canada. This was a start to a long and distinguished career in science policy work, for the last 40 years primarily working internationally. He met Nelson Mandela when he was called to the new South Africa to help them create a new science policy. He advised in places as diverse as Australia, China, Palestine, South Africa, Venezuela, and many other parts of the world. For a time he chaired the OECD’s Science and Technology Committee, and held many other international advisory posts. In recognition of his life’s work, in 1998 he was elected a Fellow of the World Academy of Art and Science. Friends and family in Scotland however, will most remember him from his days as a boy in Maybole. He was a patrol leader in the 10th Ayrshire scouts, and indeed there are photographs on the Maybole website of the 1954 visit to Germany with the scouts. He loved to walk with friends up Mochrum, and at times would even walk to Turnberry in search of golf balls. He played Rugby at school and continued this after emigrating, playing club Rugby in Canada. As someone commented, they had never seen a scrum half run so fast, so near to the ground! Above all, family and friends will remember Jim’s warmth and compassion, humour and wit and his devotion to family. He loved sport, music, read widely, and never lost his love of Scotland. He is survived by his loving wife Rita, his son Paul, daughter-in-law Colleen, his grandson Seamus, his sister Margaret Thomas, younger brother Roger, 8 nieces and nephews and 8 great-nieces and nephews. Jim’s grandson Seamus is compiling a memory box of his grandpa. If any readers have any photos or memories of Jim to share, please send them to Roger Mullin, 35 Braehead House, Victoria Road, Kirkcaldy, KY1 2SD.